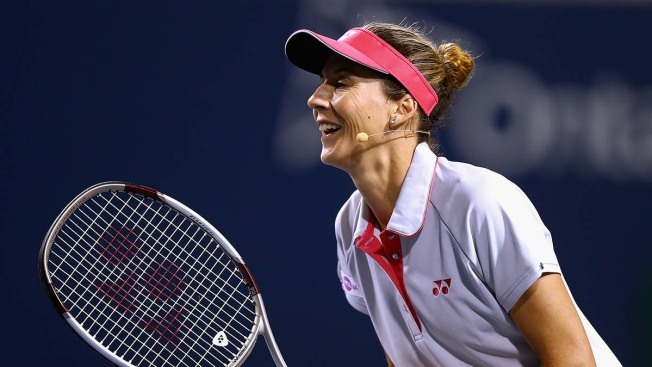 Monica Seles laughs during her exhibition doubles match on day 1 of the Rogers Cup Toronto at Rexall Centre at York University on August 5, 2013 in Toronto, Canada. Monica Seles might have made tennis look like a breeze while she was on the court, but she struggled in other aspects of her life: her eating habits. The tennis star opened up to People magazine about her binge eating disorder and how it ultimately led her to partner up with the Binge Eating Disorder Association and National Eating Disorders Association to create a public service announcement about the disease. "It took a while until I felt comfortable talking about it," she told the magazine. "That's one of the reasons I decided to do this campaign: to raise awareness that binge eating is a real medical condition." The 41-year-old athlete attributed her struggle to dealing with the pressures of sports, her father's prostate cancer and the stabbing incident that nearly ended her career in 1993. Calling her eating "uncontrollable," Seles told People that she would eat anything in sight. "My binges would be potato chips, pretzels and cookies - bags of them," she revealed. "It's really eating huge quantities of food in a very short period of time." Seles' weight fluctuated throughout her career, but she said that she had a hard time understanding what was going on because she was normally regimented about everything else in her life. "It was very hard to understand how on the tennis court, I would be so focused and so disciplined in my training, but when it came to binge eating I had zero control," she said. "I felt really embarrassed about it." After finally getting diagnosed with Binge Eating Disorder, Seles learned to manage it and now has no problem eating in public. "I don't feel the urge to go back to my house or hotel and binge eat," Seles said.